This is what I hear quite often-as with this client.”Well, I do have this old chair I inherited-it is out in the shed”. We were considering what kind of chair she wanted to purchase for her new guest bedroom and then she remembered the chair out in the shed. Incredible. Again-the message: think about chairs you can reupholster instead of purchasing a new one! 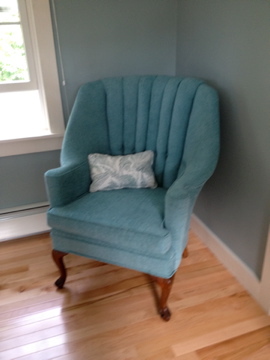 This entry was posted in reupholstery, summer/beach houses and tagged Concord, Concord Falmouth decorating summer bedrooms, Duralee Concord Falmouth decorating, Home Improvement, Interior Decor. Bookmark the permalink.